Watsonians scored ten tries against Marr at Myreside to keep their play-off hopes alive in style. They had the bonus point in the bag before half-time after a slick first 40 minutes and eventually won 64-5. 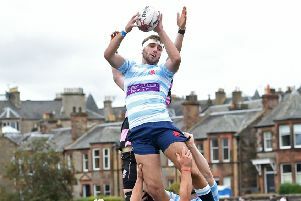 For Marr this defeat leaves them in a relegation scrap with Boroughmuir and Hawick. The home side took the lead after four minutes, a nice move seeing full-back Andrew Chalmers put winger Mark Bertram in for a try. Scrum-half Ali Harris converted and it was 7-0. Marr won a kickable penalty in the tenth minute, but full-back Rory McGee’s effort missed. The hosts had most of possession for the next spell and it seemed only a matter of time before Watsonians scored again. After a couple of close things, try number two did come on the half-hour mark when back-row Michael Fedo powered over. It was unconverted, but another try came five minutes later when a nice break by stand-off Rory Hutton set up winger Jason Harries for the try. Harris converted and it was 19-0 before the scrum-half rounded off a cracking team move with the bonus-point try to make it 26-0 at the interval. Two minutes into the second half Watsonians scored their fifth try when Fedo bagged his second of the day. Marr got their first points on the board in the 58th minute when winger Scott Bickerstaff went over for a try but Sonians scored tries six and seven soon after, Harries getting his second and then Chalmers ghosting over to make it 45-5. In the 67th minute Harries went over to complete his hat-trick and a ninth try came from replacement James Miller and then Bertram completed things.